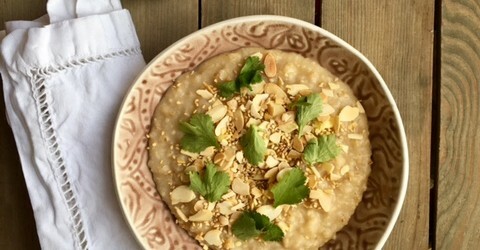 I love porridge and miso – but together? Miso porridge kept popping up on my Instagram feed and being curious I decided to give it a go. I was not disappointed- this was a delicious breakfast and incredibly satisfying. It’s a great weekend brunch choice as it is quite substantial. It would make a brilliant post-run choice especially topped with a poached egg for extra protein. Miso is a paste made from fermented soy beans and is a staple in Japanese cooking. It can help boost healthy gut bacteria and has a delicious savoury umami flavour. First toast your seeds and almonds by placing in a small pan over a moderate heat for approx 3 minutes, shaking occasionally until they turn golden. Remove from the pan and allow to cool in a dish. Put the water and miso paste into the pan and whisk well. Add the oats, boil and simmer for 5-6 minutes. Add the tamari and sesame oil. Put the porridge into the bowl and add your toppings.